The day will be split into two sections with a hands-on workshop for 30 people at the AS220 studios in the morning and the symposium for 120 people (including the 30 morning workshop participants) at the Providence Public Library in the afternoon. At the workshop participants will rotate through three activities*: cyanotype photography, wet plate collodion photography, and a discussion and demo session that will reinforce the hands-on sessions. At the symposium participants will attend an opening talk about the history and techniques of 19th Century Photography. Then in two groups of 60 they will rotate through two workshop-lite sessions on the identification and description of 19th Century photos. There will be a 30 minute break between the two sessions. All participants will attend the final presentation on the collaborative project with Providence Public Library, AS220 Studios and the Wonder Show dealing with a collection of glass plate negatives and creative writing. The presentation will end with a magic lantern show presented by the Wonder Show group which incorporates the PPL glass plate negative collection and a community writing project. Please Note: Due to the nature of the historic building in which AS220 is housed, two of the morning workshop sessions will be held on an upper level with no elevator access. If you have have questions or concerns about accessibility and/or wish to request accommodations related to this or other aspects of the workshop, before or after registration, please contact NEA's Inclusion and Diversity Coordinator, Anna Clutterbuck-Cook at diversity@newenglandarchivists.org / 617-646-0561. *available to NEA members in good standing who self-identify as un- or under-employed. Brett Henrikson is an Artist – Photographer who lives in Pawtucket, Rhode Island. He received his BFA from RISD in 2011 and is currently the President of the Pawtucket Arts Collaborative a local non-profit arts organization. He specialized in Alternative and Antique forms of photography with an emphasis on Wet Plate Collodion. He has preformed Collodion demonstrations at AS220, The Chrysler Museum Glass Studio and the Rhode Island School of Design to name a few. He believes that the hands on aspects of working in the darkroom and using film or large format gives the artist a real sense of creation over their work. He is also in the process of opening a new museum/classroom space in Central Falls, Rhode Island. Samuel Thompson is a photographer who arrived at AS220 via the fledgeling Industries program. For the past 7 years he has indulged and explored his interest in analog photography and as a key member and instructor in AS220's Media Arts program. In his life outside the arts-non-profit, he works in a boring day job and is teaching his three children to be equally obsessed with all things erratic and unusual. Martha Mahard is an Associate Professor of Practice at the Simmons College School of Library and Information Science. She has more than three decades of professional experience with the Harvard University Libraries, including work in photography and visual collections at the Fine Arts Library, the Harvard Graduate School of Design, and the Harvard Theatre Collection of The Houghton Library. In addition to her numerous journal articles and presentations in the field of photographic archives, cultural heritage, and digital preservation, she is the co-author with Ross Harvey, of The Preservation Management Handbook: A 21st Century Guide for Libraries, Archives and Museums (published by Rowman and Littlefield in April 2014). She has served as a consultant on major projects for museums and libraries, including the Worcester Art Museum and the Boston Public Library, and is a current board member at the Northeast Document Conservation Center. Mahard received an M.A. in Theatre History from Tufts University, and her M.S. and D.A. from Simmons SLIS. Deep is an artist and photographer who currently teaches photography at the University of Connecticut, and also works for University Libraries (UConn) as the Project Coordinator for Collections. Her processes of image making include merging alternative processes, mix media and hybrid workflows. Deep’s images have exhibited in Oregon, Texas, Connecticut, upstate New York and NYC, including web magazines and gallery publications. Samples of Deep's ongoing creative writing prose "To Slow the Sinking" have been included in various web and book publications. Jane Turano-Thompson, a graduate of Smith College, is an independent sch olar and art historian, specializing in 19th-century American photography and its relationship to popular portraiture and culture. Formerly Editor of The American Art Journal, in New York and subsequently Consulting Editor of that magazine, she has written for numerous art and antiques publications and has lectured at the Dublin Seminar for New England Folklife, the American Antiquarian Society, the New England American Studies Association, the Smith College Museum of Art, Middlebury College, the New Bedford Whaling Museum, the National Portrait Gallery, and many other museums and historical societies. She has spoken numerous times at the Daguerreian Society’s annual symposia. Her essay, “Photography and the Maritime Portrait (1840-1865) was published in the Oxford Encyclopedia of Maritime History, Oxford University Press, 2007. Several images from her collection were selected for the Metropolitan Museum of Art exhibition, “Photography and the American Civil War,” and published in the accompanying book, in 2013. Since 2006, Robert Burton has been Photograph Cataloger for Weissman Preservation Center at Harvard University. In the last four years, he also has been a photograph cataloging consultant and member of the Advisory Committee for the Foundation of the American Institute for Conservation’s Hermitage Photograph Conservation Initiative. Previously, he worked as a photograph cataloger at the San Diego History Center and a preservation librarian at the University of Pittsburgh, where he received both his BA in writing and MLS with a specialization in preservation. He has been an active member of the Society of American Archivist’s Visual Materials Section, serving as liaison between VMS and AIC's Photographic Materials Group for six years, and has given various professional presentations on the preservation, history, and cataloging of photographic materials. Eve Neiger is an Archivist at the Beinecke Rare Book and Manuscript Library at Yale University. Her cataloging and processing work is primarily focused on photographs and other visual material including the papers of 20th century photographers and illustrators. Her experience as a fine artist has fostered an interest in historic photographs and the personal stories they reveal. As a visual media archivist and preservation specialist her goal is to increase public exposure to the valuable information stored in archives and special collections by increasing awareness, enabling access, and preserving archival material for future users. Matthew Daniel Mason, Ph.D., is an archivist chiefly responsible for processing collections of photographs and other visual resources at the Beinecke Rare Book and Manuscript Library at Yale University, as well as the outgoing chair for the Visual Materials Section of the Society of American Archivists. He is a co-author of the award-winning visual history of Native Americans in Wisconsin, People of the Big Voice: Photographs of Ho-Chunk Families by Charles Van Schaick, 1879-1942 (2011), as well as the recently published work,Through a Woman's Eye: The Early 20th Century Photography of Alabama's Edith Morgan (2015), which presents an evocative collection of photographs made by Morgan of Camden, a small town in Wilcox County, Alabama. In addition to his archival and scholarly work, Matt teaches courses in United States history and the history of photography at Quinnipiac University. Jordan Goffin is the Special Collections Librarian of Providence Public Library. He has previously held special collections positions at the University of Montana in Missoula and the Rhode Island Historical Society, where he developed the online Atlas of the Rhode Island Book Trade in the Eighteenth Century. In addition to an MLS from Indiana University, he holds an MA in medieval English literature from the Ohio State University. Carolyn Gennari is an interdisciplinary artist based in Providence, RI. Her practice explores the intersections of art, history, and material culture. Founding The Wonder Show in 2011, a project that works to bridge a discourse between archives, storytelling, and performance, Carolyn explores new ways to collaborate with communities through spectacle-led learning experiences.Currently, she is a MFA candidate at the University of Michigan, Penny W. Stamps School of Art and Design. Faye Thompson is a young writer who enjoys spending hours making mix tapes or temporarily capturing local wildlife for observation. She can typically be found climbing trees or making art, and come September will be attending Lincoln School for Girls. Linda FitzGerald attended U of Penn studying theatre & psychology, then travelled the world, moved to California, danced, worked in film, music, film, TV, met and married a gifted writer/director, raised an amazing son turned illustrator, divorced, moved to Providence four years ago where she now enjoys her own art, writing and ever growing joys in life. Laura Brown-Lavoie is a writer and farmer in Providence, RI. She was a finalist at the 2013 Women of the World Poetry Slam, and a member of the 3rd place Providence team at the National Poetry Slam in 2011. Her fiction has been published in the Los Angeles Review and The Brooklyn Rail, and her essays have been featured in The Seneca Review and on Construction. She served for two years as the co-host of the Providence Poetry Slam, and continues to work as a mentor for youth poets. Today's performance is one of three Wonder Shows on which Laura has collaborated with Carolyn Gennari. Matthew Lawrence is a writer and editor based in Providence, Rhode Island. He co-edits Headmaster, a project based art magazine, and runs the Rhode Island events website Law and Order Party. The Journal for Contemporary Archival Studies (JCAS) announces a call for submissions on the topic of 19th-century photography collections and techniques. Go to the JCAS section of the website for more information. 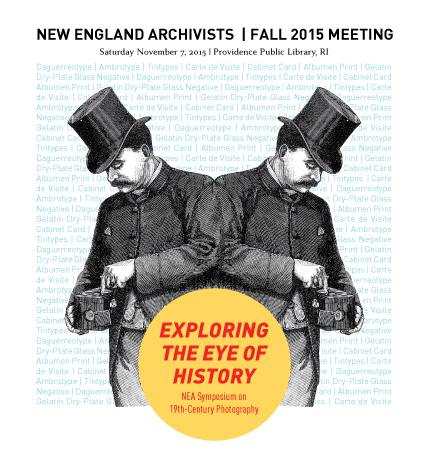 NEA is grateful to the Providence Public Library, Belfor, Hollinger Metal Edge, and Gaylord Archival for their support of this meeting.